With my pregnancy with Addison I was given quite the shock when I learned that I had gestational diabetes. At the time I had no idea what that was. I had never heard of it. I knew nothing about it. It was all a complete shock. That pregnancy was tough in so many ways and by the time I hit the third trimester I had finally stopped throwing up but suddenly everything had to change because I had GD. I had to find a way to stay active. I had to completely overhaul my diet. I had to take my blood four times a day. It was hard and it sucked. So when I got pregnant with Connor, even though we used a fertility clinic which included a diabetes drug to help us get pregnant, I fully expected to have GD again. I had learned a lot about it during that time I did have it with Addison, like I only had a 10% chance of having it in the first place and any other pregnancies I had had a 90% of having it again. So when it came time to do my glucose tests which I dreaded doing I figured it was in my future. I ended up failing my 1 hour by a lot and moved on to my 3 hour. At least this time I didn't have to retake the 3 hour because I got sick less than a hour in like with Addison. But as it turned out things were good. My numbers weren't even borderline. They were right in the middle of where they were supposed to be which meant somehow in my second [full term] pregnancy I had escaped without gestational diabetes. But after we got pregnant this time I had wondered about my odds. With Addison we had gotten pregnant naturally and I had struggled with food my entire pregnancy. With Connor we had help and things weren't as hard. 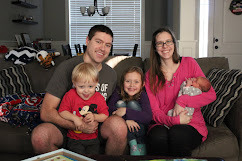 This time we were somehow able to get pregnant naturally again (in your face fertility clinic that told me Addison was a fluke and I couldn't get pregnant naturally!) and I was back to the food struggle. Throughout the entire pregnancy I have struggled with trying to figure out what to eat then after I would finally eat something more often than not I felt awful. I just couldn't find a balance and I was starting to wonder about my odds of having gestational diabetes again. I dreaded when the time actually came to take the test. There is just nothing good about those glucose drinks. You pretty much just had to grin and bear it. Small sips. Drink water along the way. And hope for the best if you have a weak stomach. That appointment I actually didn't end up having to take any kids with me which I was thankful for. They would have done fine but it was nice to not have to worry about them during my 1 hour. Plus I was nervous if I would even be able to keep the drink down since high sugar anything wasn't sitting real well with me as of late. Since I had an OB appointment as well as my 1 hour I went to take my drink first before my actual appointment which helped kill some time and I wasn't just sitting the entire time. I headed back to the lab, left my urine sample (actually one of my least favorite parts of pregnancy is those urine samples you leave every appointment because as you get bigger, it just gets harder! ), then it was on to my drink. I ended up with orange this time and told I had five minutes to get it down. So I started drinking. The lab techs talked to me while I drank which actually helped distract me from what I was doing and I able to get it down in three minutes then go about my appointment. I was told that I would see my results in patient portal if everything was normal but would get a call otherwise on Monday (my test was Friday) and I left fully expecting a Monday phone call. Monday rolls around and sure enough no notifications in my patient portal and that afternoon I got a call. But it didn't quite go as I expected. The nurse explains to me that there is some debate about the top number, if it should be 130 or 140. Turns out my number was 139. So instead of making me do the 3 hour with my number right in that borderline range I would do the 1 hour again in four weeks then we would go from there. I was surprised by the whole conversation and pleased that for the first time I didn't fail my 1 hour. It wasn't a complete pass but it wasn't a fail either. I would take it. So I wait out my four weeks and back for another OB appointment and back for another 1 hour drink. But this time I actually had both kids due to Addison having a doctor's appointment as well as a flu shot for Connor and of course my OB. But when I get there the computers are down. The anticipation that had been building about retaking this test would just continue to build because I wouldn't be doing it that day. So I got a call a day later to schedule my appointment and once again we would try again. Rob agreed to take the little guy (Addie was in school) since I was just sitting for an hour. I was a ball of nerves the day of though - I really hate that drink. I dropped Connor off at Garmin to spend an hour with daddy which included a picnic for them. And i went over to the doctor. I chose the orange drink and was told that I had five minutes to drink it and I needed to let them know when I finished so they could start the timer. I got the drink down, let them know and hoped my stomach would keep it down. I hadn't exactly been feeling great that morning so I was a little worried. I sipped water and started reading to distract myself. As long as I kept my mind busy I was good. Then about 30 minutes in I started to feel pretty awful. My stomach took a turn and I got really sleepy. And actually I always get super sleepy after doing the glucose test so it wasn't a major shock that I got as tired as I did. I got a cute text from Rob of him and Connor and some encouragement and knew I only had 30 minutes to go. Mind over matter and my last 30 minutes was up. I got my blood draw and pretty much crashed the rest of the day. I just didn't have anything left with the sugar crash I was experiencing. And now it was back to waiting for either an email notification or the phone call to tell me that I would have to do the 3 hour. And then the phone call came. Sure enough I was borderline again and with my past it was better to take the 3 hour so I got it scheduled and we would go from there. But also at least I knew that this was by the last time I would be doing this - I guess that's the advantage of knowing this is our last baby and I wouldn't be doing this again. So again I went in for the 3 hour fasting glucose lab. I got my first [fasting] blood draw then started drinking. It didn't go well. I struggled getting through the drink. About halfway through my stomach started turning and I was sure it wasn't going to stay down. I really and truly thought I was going to throw up while I was drinking it and just knew that this wasn't a great start. But I sipped some water and kept telling myself mind over matter and got it down. And now all I could do was wait. I did my best to keep myself busy because as long as I'm not thinking about it I was golden. And I got through my last three blood draws without issues. I was definitely tired and run down. I wasn't feeling awesome but I also didn't feel like I was going to be sick either. So basically I survived. I made it through my four blood draws and wanted nothing more than to go home and take a nap. And then it was time to just wait. The first thing I told Rob was that I didn't care what the results where - I could have gestational diabetes or not, it didn't matter - all I cared about was that I didn't ever have to do that glucose test again. A couple days later I went in for my regular OB appointment and she went to look to see if my results were back yet. She gave back with a look on her face that told me everything. I was being diagnosed with gestational diabetes again. She said a middle number was really high (it was almost exactly like it was with Addison). So she ran through everything really quickly and I was back to testing my blood sugars and being very mindful of what I can eat. Also that meant weekly ultrasounds to check on Emma, plus a delivery by 39 weeks. After having an easy non-GD pregnancy, this pregnancy just keeps it coming with yet another hit. I have gestational diabetes again.